Hop in the beautiful pool and cool down after a long day. Grand piano and fanciful chandeliers welcome your stay. Spacious kitchen, dining room, and living room make your rental a perfect home base. One restaurant is classy, the other casual. Take your pick. Every vacation needs a mani-pedi or massage. Relax with a tropical drink at Calypso's Pool Bar & Grille. Two bedroom residences have private balconies. Relax with a good book while enjoying a soak in the jetted tub (in all 1-bedroom deluxe and 2-bedroom condos). 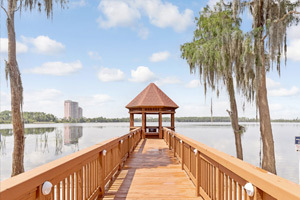 Caribe Royale is a 53-acre Tropical-style resort that has an elegant, classy tone that offers perfectly appointed residences to families, groups, or convention goers. Stop by your condo to drop off your luggage – don’t bother unpacking, there will be plenty of time for that later! Change into swimsuits, grab goggles, pool toys and water wings. Spray everyone head to toe in sunscreen and get ready to hit the pools. There’s a freeform pool with waterfalls and a 75-foot waterslide and an additional villa pool with two hot tubs. Little ones won’t be able to get enough of the water playground. Rent a cabana or lounge on the pool deck with the latest issue of People Magazine. Order lunch and a refreshing cocktail from the poolside bar and grill. Play a game on the lighted tennis and basketball court or get in a workout at the fully equipped fitness center while the kids hang out in one of the two video arcades or the playground. Treat yourself to a massage at the on-site spa – you deserve it. Need an afternoon pick-me-up? Head to the on-site coffee shop, Java’s Coffee Cafe. There are also two restaurants and a 24-hour deli cafe. One-bedroom condos sleep two to four guests and offer a king bed or two queen beds. Kitchenettes with a mini fridge, microwave, and coffee maker have what you need to make the basics. Upgrade to a one-bedroom deluxe for more space and an in-suite jetted tub. Two-bedroom condos sleep four guests and have enough room for all of the kids and their toys, blankets and games. A family field trip to Publix is definitely in order – your full kitchen won’t stock itself. Recruit the kids to help bake your famous double chocolate brownies (not that they’ll need convincing). Did the kids end up with chocolate on their clothes? Two-bedroom condos have in-suite washer/dryers, so that won’t be a problem. In-suite entertainment includes a Flatscreen TV with HBO. Gather everyone on the couch, put one of the kids in charge of the remote and another on snack duty and get ready to be entertained. There’s nothing like a relaxing soak in your jetted tub after a long day at the theme parks. Caribe Royale Orlando provides a shuttle to the Disney parks and to Disney Springs. Walt Disney World® has four theme parks and features several rides and attractions. Visit the 11 countries of the World Showcase® to experience their food and culture at Epcot. Ride through Arendelle with Elsa, Anna, Sven and Olaf on Frozen Ever After. Disney’s classic attractions It’s a Small World®, Peter Pan’s Flight®, Country Bear Jamboree® and many others can be found at Magic Kingdom®. Hollywood Studios® has Toy Story Mania, the Rock’n’Rollercoaster starring Aerosmith and Fantasmic! Pandora – The World of Avatar® can be found at Animal Kingdom®. Gather the shopaholics in your crew and head to Disney Springs. Shops include Kate Spade New York, Pandora Jewelry and Sephora. World of Disney® is the world’s largest Disney character store and is worth a visit. Hungry? Rainforest Cafe, House of Blues and Earl of Sandwich are just a few of your options. Catch an animal show featuring whales, dolphins and sea lions at SeaWorld. Ride Mako, Orlando’s tallest, fastest and longest rollercoaster. Little ones will love Shamu’s Happy Harbor; it’s a kid-friendly rollercoaster. Muggles, rejoice! You can finally experience what it’s like to be a wizard thanks to The Wizarding World of Harry Potter®, located over both parks of Universal Orlando®. Be sure to get a park-to-park ticket to experience everything (and ride the Hogwarts Express!). Universal Studios® is where you will find E.T. Adventure, Shrek 4-D and The Simpsons Ride. Universal’s Islands of Adventure® has Jurassic Park River Adventure, Skull Island: Reign of Kong and The Incredible Hulk Coaster. Any guest under the age of 21 must provide a valid credit card in order to check-in.